Jones Lang LaSalle (JLL) is the property manager of the mixed-use commercial building at 895 Dove Street located within the Newport Plaza complex – that was originally constructed in Southern California in 2000. The five-story property, which was 98% leased at the time of sale, serves as the headquarters for law firm Newmeyer & Dillion, which occupies about half of the building. It is commonly referred to a Class A office building with spectacular amenities and serene architectural elements. Verde Solutions, LLC retrofit project on the 895 Dove Street office spaces, parking garage and parking deck consisted of a mixture of LED products from 2×4 troffers and linear LED tubes to commercial downlights and exterior shoebox fixtures. With a projected annual energy savings of nearly $50,000 and 55% reduction in energy consumption from lighting, this project proves, yet again, that making the switch to LED will guarantee a cut back in energy consumption versus “traditional,” out-dated lighting technology. 2×4 Troffer fixtures were a large amount of this LED retrofit project. As demonstrated in the table above there is a significant reduction in energy costs. The client and their tenants would have to replace their existing fluorescent troffers FIVE TIMES over the lifetime of just one Verde LED troffer fixture. In addition to dramatic savings, these before and after pictures demonstrate the LED lighting output is much higher in quality and appearance when compared to conventional lighting. 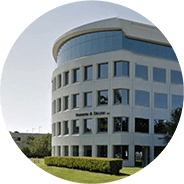 Verde Solutions’ lighting retrofit for the 895 Dove Street building in Newport Plaza reduced its lighting energy consumption by 55%. 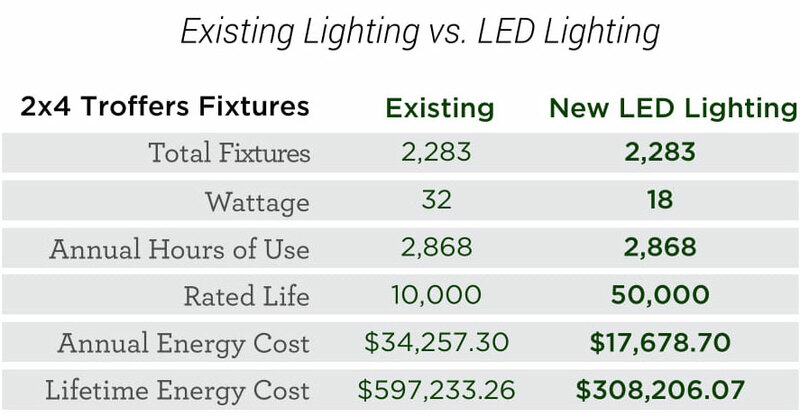 This significant improvement in energy efficiency will result in an annual energy cost savings of $49,795 during the rated life of LED lights, along with a one time $3,079 utility rebate. Every month, the building can expect to save $4,149 on their electric bill.